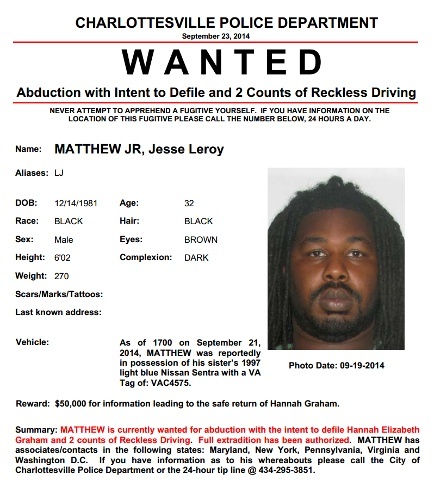 Charlottesville police now say they have charged Jesse Leroy Matthew, Jr., 32, in the disappearance of Hannah Elizabeth Graham. Matthew is wanted for abduction with the intent to defile, in addition to two reckless driving charges previously announced. Police are currently looking for Matthew and have released a wanted poster for his arrest. Investigators believe Matthew is the last person the 18-year-old Graham was with before she disappeared early on Sept. 13. CHARLOTTESVILLE, Va. (AP) _ Police say they have charged a suspect in the disappearance of UVA student Hannah Graham. Charlottesville Police Chief Timothy Longo said at a news conference Tuesday night that police obtained an arrest warrant charging 32-year-old Jesse Leroy Matthew Jr. with abduction with intent to defile. Longo has said they believe Matthew was the last person seen with the 18-year-old Graham, who disappeared 11 days ago. Authorities are looking for Matthew, last seen Saturday when he stopped by the police station to ask for a lawyer. Police say he sped away afterward, losing officers who had him under surveillance. Investigators executed a second search warrant on Matthew’s apartment on Monday, taking articles of clothing. Authorities first searched his car and apartment Friday. Information that came up during the investigation led to a second search. Police are awaiting lab results are still trying to locate the campus employee to arrest him on reckless driving charges, as well as the new felony charge. Graham, a sophomore from northern Virginia, has been missing since Sept. 13. WFIR staff contributed to this report.